Again as I look back over the past year I can’t help to be so very proud of being part of the Ladies Auxiliary of the Knights of Columbus. This year at the Knights of Columbus State Convention our auxiliary took first place in the following categories: Outstanding Auxiliary of the Year Award: Given for our dedication and service to Family, Church, Charity, Community, Membership, Programs and the Ladies Auxiliary Council; Auxiliary Lady of the Year Dorry Dahl Award: Given in grateful recognition and appreciation for her continuing support and dedication to her Family, Church, Community and Ladies Auxiliary and Council; Programs/Service Activity Church Award: Given in grateful recognition and appreciation for service and support of our church; Program/Service and Activity Charity/Fundraising Carson’s Community Days Award: Given in grateful appreciation for our fundraising activities in support of Charities in our community and last but not least Ladies Auxiliary Scrapbook 1st Place Award. All of this has been accomplished through the hard work and dedication of our members. This has made it even more difficult to choose the Lady of the Year. One member, however, stands out and has been chosen for her outstanding dedication to the parish of St. Johns, her Faith in God and her service to the Church and Community. 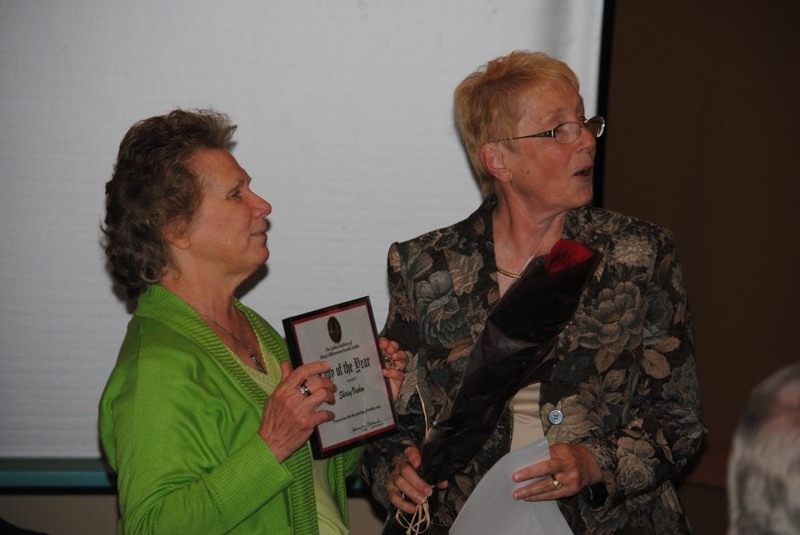 I am proud to announce the Lady of the Year for 2015: Shirley Vachon. Shirley has shown us just how much, by her example, that having faith in God and prayer can get us through even the most difficult times. We can make a true difference in our lives by putting our trust in the hands of God. Shirley is currently in her third term as Trustee for the Ladies Auxiliary. Shirley can always be counted on to take pictures at all the events. She willingly volunteers and has accepted all tasks presented to her. Her service to the Church includes being a Minister of Communion and a Sacristan. Her devotion to adoration finds her attending weekly adoration. She is a participant in the Bible Study Program expanding her knowledge of her faith. As a lay Marianist Affiliate of The Society of Mary, she leads study group sessions bringing us closer to Jesus through our Blessed Mother. Shirley also volunteers to stuff bulletins weekly as needed in the Parish Office. In Church activities, she willingly supports all the parish functions including the Bake Sale, Lenten Suppers, St. Joseph Table and other activities where the Ladies Auxiliary is asked to serve at the many church functions throughout the year. She actively supports all the Knights of Columbus functions including the 5K Run and Tootsie Roll Drive. In the Community, Shirley serves on the fundraisers the Ladies Auxiliary holds for the Food Pantry. As part of our Community service, Shirley is an avid supporter of the Michael J. McGivney Centers of Hope and Healing. While at the last fundraiser for the Center our ladies were asked again to help for both auctions at the dinner and Shirley was again able to take part in this most worthy cause. Shirley is truly an active member of the Band of Angels as our Ladies Auxiliary is referred to by the Board of Directors for the McGivney Home. At this year’s Knights of Columbus Convention, Shirley volunteered to take the pictures for the Ladies Auxiliary Meeting and Awards Presentation. It is my privilege to award Shirley the title of Lady of the Year for 2015. Shirley you are truly a remarkable and awesome individual. At this time I would like to have Monica, last year’s recipient of the Lady of the Year Award, come up to present Shirley with a token of appreciation for her outstanding service. 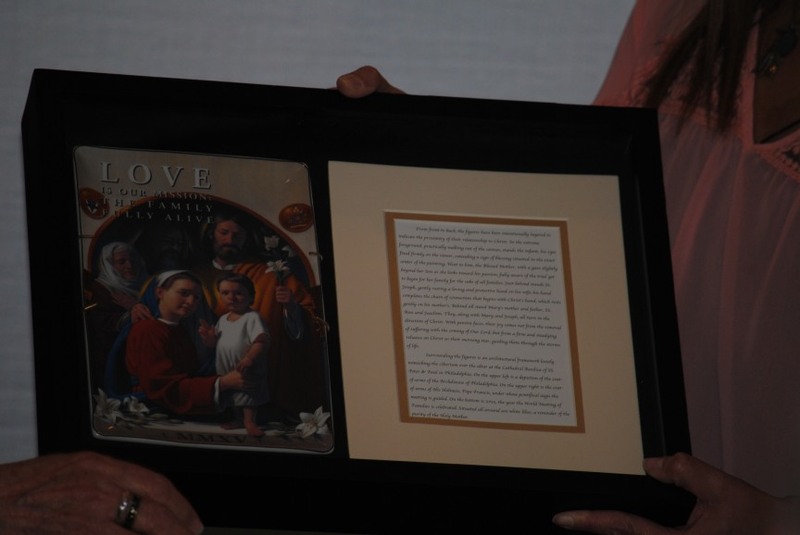 This plate with the picture of the Holy Family reflects Shirley’s dedication to her family, the family of St. John’s and our community. Please join me in congratulating Shirley on this well-deserved award.